My symptoms of bedbug bites are extreme itching on feet and knees, and little bumps on legs and lower arms. I have been living at my apartment for more than 2 years now and I never had a problem with bedbugs. I even bought a puppy for my daughter, but a couple months later my daughter and I started getting mosquito like bites and my husband didn't get anything so we assumed it was mosquitos because it was one of those hot days. But every day after that we still kept getting bites all over our body so I started thinking the dog had fleas. So I bought him some flea treatments and nothing, it was still the same. So one night I couldn't stop scratching my leg and I got up and I started searching the bed and to my surprise I found bed bugs. I was so shocked and ever since every night is terrible. My daughter's skin looks bad because of the bites I'm even embarrassed showing my legs and arms because they are all marked, so I'm planning to move and throw all my furniture out. I felt burning like with a cigarette when the bedbugs bit. I looked on the collar of my clothing, and found them there and in my underwear. I have red bumps. I have been experiencing itching in a few different places on arms and legs. The itching is always those same few areas and it itches like crazy and won't stop for a couple of hours. But when I check out the itchy areas I don't see anything but a little redness where ive been scratching. It's been consistently in the same areas and I just found out someone I know has bedbugs and I have sat on their couch! I hope I am wrong but ive never had this kind of itching experience before. Kwell lotion is the right cure for on-person bedbugs and scabies! Apparently no longer available, since two medical facilities when asked for this lotion, one gave oral tablets which I would not take and the other gave me a more preferable one being called permethrin cream. I do believe the old Kwell lotion is still the best! It's important to remember not everyone experiences the same signs and symptoms from bedbug bites. Many show no signs and it can take quite a while to even realize there is an issue. If one family member is showing bites, check the whole house for other evidence! My initial sign was odd bites on my neck, then noticed the trail of blood on my tile floor from my bed post to under the baseboard on the wall facing the apartment they originated in. People say they are harmless and just an annoyance, but they are mentally damaging, and scar your body from the bites. I still have scars over a year later from them. And had to be on steroid and anti-itch creams for a good while. I can't travel for fear of being in a hotel room at night, where they are often found the most. It has scarred me in many ways. I had small bites on stomach feet lower leg. Bedbug bites on stomach around the waist and front of stomach and bites on feet and ankles. There was awful itching. We just moved into this house a couple of months ago, and my mom wanted to keep this nice looking couch that was in here, and the beds that the last people who lived here left. We have 4 cats and a dog, so when the 'bumps' started appearing, we assumed it was fleas. Well, lo and behold, it is bed bugs. I just found a bed bug on my sofa. I started getting what I thought were mosquito bites in January. My kids and I were covered in bites. They look and feel just like mosquito bites, so I really didn't even think that it could be bed bugs. I did find a mosquito in my living room last week and I was able to kill it. So I thought all the bites were over. Well, they weren't. I looked up on line info on bed bugs and I checked all my furniture and beds and I didn't see a thing. So I thought maybe it's another mosquito. It wasn't a mosquito. I think I know where they came from too. I have been living here for 5 yrs and never had any problems with bugs. My step son comes over every other weekend and he was complaining of "spider" bites he was getting at home. This was after he got a new bed, which I think his mom got as a hand me down. I bet that is where they came from. I am so freaking upset. They just gross me out. I thought my child was bitten by mosquitoes, as he said they were itchy, after a few weeks and the marks not going away and still more appearing I found out with research that we had bed bugs! I immediately went to the mattress, checked the corners and yes low and behold there they were! I went to my room checked the bed frame and found them having a party with tons of friends on the wood. I freaked out. After buying a few large containers with lids to place my items in, I threw out all my wood items and called the pest control people, I still only sleep on the mattress directly on the floor, but I am SLEEPING! I continued to call the pest control company for three months once a month for treatment weather I needed it or not, I wasn't going to take any chances. I have tried other methods, but nothing really works totally like the professionals. I been living at my apartment for more than 2years now and I never had a problem and I even bought a puppy for my daughter, but a couple months later me and my daughter started getting mosquito like bites and my husband didn't get anything so we assumed it was mosquitos because it was one of them hot days, but every day after that we still kept getting bites all over our body so I started thinking the dog had fleas so I bought him some flea treatments and nothing it was still the same so one night I couldn't stop scratching my leg and I got up and I started searching the bed and for my surprise I found bed bugs I was so shocked and ever since every night is hell. My daughter's skin looks bad because of the bites I'm even embarrass showing my legs and arms because they are all marked, so I'm planning to move and throw all my furniture out. There was three children in the bed but only one child was severely bitten by bedbugs. The other children had one or two bites or none at all. I moved into a group home a couple of months ago. I discovered red welts that itched greatly. I rubbed the spots with alcohol and applied a store version of Tinactin foot cream that also kills ringworms. The itch stopped the same night, and the swells disappeared after the 3rd application. My wife and I had no bed bugs for a whole decade, but entered a home in which two wonderful cats lived. They of course were petted and handled. We caught the bed bugs. The family had welts on their legs and body. I found that bed bugs will stay in the sleeves of clothing, sweatpants and coats; wash everything in superhot water. I first got bed bug bites 5 years ago after visiting my mother. Since then, every year in the summer, I get these bites. They often are in a cluster and they itch like crazy. They last a long time. About 6 weeks ago I started noticing this rash from my elbow to my wrist and on one of my legs. They itch and burn which is very noticeable and began to feel restless. I then found them in my couch! I've bought pesticides from a co-op. We spray and spay and I still have trouble sleeping, haven't seen anymore bites but have trouble sleeping under covers. My son and my boyfriend had moved into a friend's house this past December. A few weeks later, I moved in. After a couple nights of sleeping there, I had bumps all over my body that were bigger than a grape and that itched horribly. No one else in the house had them, not even my son. At first I thought for sure they were hives, but they are bedbugs. I have been spraying a store-bought pesticide, vacuuming my bed, spraying my bed, and vacuuming every inch of my house for three months now. Once I think I've gotten rid of them – I get bit. Unfortunately, I'm in a sticky situation with the people who we "rent" from, so they refuse to do anything about it. But I'm terrified of taking them with me to my permanent home. I need advice. I recently rented a room from a friend who told me he had seen a bed bug in the room but had fogged the room three times a few weeks prior and hasn't seen any since. So I moved in and 11 days later I saw one crawling on the bedroom door. I immediately left and went to a motel. Now I've noticed bite marks on me, my dogs are itching, and there's a foul smell on my clothes. I don't know if they are in my clothes or if they are biting my dogs or what. I'm so afraid of taking the bed bugs with me when I find a permanent place to live. It started with bites that looked like hives or mosquito bites. Everyone in the family was bitten. We looked in the children's mattresses and did not see anything. Then we looked in my daughter's mattress, and lo and behold, there they were. We discarded the mattress and bed frame but not soon enough. Two months later, they had migrated into the children's mattresses. Ultimately, we had to discard their mattresses also. Please always have professionals handle bed bug problems. Hardware or store-bought pesticides do not work. 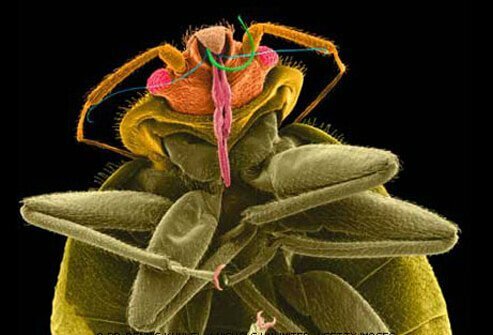 Bed bugs have made a comeback. Always look around the home for them. I noticed what I thought were hives on my legs and arms. I just did not know what was causing the hives until one evening, I saw a bug crawling on a bag I had on my sofa. It was a bed bug. An exterminator came in and found another live one on the head board on the second floor. I apparently picked it up in the apartment building I work for. I had a severe allergic reaction to bites from bed bugs. My first symptom was a highly sleepy state, almost like a depression. I was unable to put one foot in front of the other. Then I began to itch … and itch, and scratch ... with no relief. Cortisone cream eventually relieved it a bit, but it went on for weeks. I had got them from a hotel, so I didn't worry that I'd brought them home. My problems with bed bugs all started a year ago when I had felt very itchy. I also thought that they were mosquito bites but then I knew it wasn't because I hadn't seen any mosquitoes. So I checked my bed and found bed bugs! Tons and Tons! They have been living been with me for a year now just because I didn't take the time to check my bed. I even bought a new mattress but they still came back. I had also found them in my clothes that were in the closet. They bit my fiancé so bad that I had to take him to the hospital. If you have bed bugs please call a professional for your own good. My wife and I started to notice mosquito like bumps about four months ago and that they were just that mosquito bites. Then one night we saw a bug in the bed and killed it and did not think anymore about it. Then I noticed this started going on every morning we woke up. Then we noticed that we were killing more and more bugs on a regular basis, so I just looked around the bed because some of the bugs that we killed splattered blood and having a cat I knew ticks don't splatter like that. All around the fold of the mattress there they were bedbugs. I've heard of them but didn't take them seriously until the past four months. I've been spraying raid and everything. I'm constantly checking the mattress every night before going to bed now thinking I'm doing something but I'm really not. I was in a hotel this past weekend. During the night, I felt something crawling on me, so I swatted it. That happened a few more times, but I didn't think too much about it. The next morning, there were spots of blood all over my side of the bed and my pillow. Then I saw some bugs on the bed. My husband swatted one with a belt and it exploded into a blood spot. Then I noticed a whole bunch of bugs on the ceiling. My symptoms didn't start until the following morning. I noticed raised red bumps all over my left breast, left arm and some on my back, my right arm and my right thigh. They started itching intensely and progressively seem to get worse. I looked up bed bugs, and there's no doubt that's what happened to me. I reported the bugs to the hotel management. They comped our room for the first night, and moved us to another room. My symptoms didn't really start until we had left the hotel. I am writing them a letter. I received more than 100 bites and had to be treated with prednisone and antibiotics when my son and I stayed at a hotel in Florida this summer. My vacation was ruined and the hotel stated that they would make it right, but they did not. At first the symptoms were mild, and I did not think seeing the doctor was necessary, but less than 12 hours later, I developed a severe rash and itching. When I called the hotel, they never returned my call, even though they stated they would make it right. The first time I saw a bed bug was this past weekend at the American Host Motel at West Falmouth, MA. I rented the motel for 2 days and I end up leaving the next morning because my daughter found these bugs all over her bed. After a few days we all have like mosquito bites all over our bodies, but my daughter and me are having skin reactions as of today. I'm trying to find out if they transmit any disease? I'm planning in visiting my doctor for his opinion. My fiance and I stayed in a weekly stay hotel. The first night was fine, by the second night he woke up jumping out of bed and getting on the verge of being hysterical. He had bites all over his back and arms. I didn't get any bites I was sleeping in long pants and a long sleeve shirt ge had his boxers on. By the third night he was covered in bites. The next day we did find 4 bed bugs and when he killed one of them blood splattered out. We told the manager all they did in the beginning was move us to another room that was after the maintenance man came and found one behind the headboard. We moved and it did subside. What happened in the end is that he complained and we received all of our money back along with the deposit. It was either that or we were going to the Board of Health for our state with the evidence. We had trapped to of them in a cup and the bugs died in the cup that along with his bites was our evidence. I saw an oval bug a few nights ago crawling on my blanket and was able to kill it. I do know in Cincinnati we have them (bed bugs) bad of course you always think it will happen to someone else and never you. Well I also had noticed some hives on my legs. I thought it was from the antibiotics that I had started taking. Well tonight I found another bug crawling about the computer stand. Now while 2 bugs don't make an infestation I think I should see about what I can do before it becomes one. I thought a mosquito had taken me for an all-you-can-eat buffet. I woke up with 4-5 bites, and as the day went on I realized these bites all were surrounded by 2-3 others. In total that meant that I had about 15 bites that were very itchy. We moved into a beautiful rental 4 months ago, for the last 2 months, I'm battling bed bugs, I've been exterminated 3 times in 1 month, froze all our clothing, bites on my upper torso, and been to the doctor. I have been having red spots appear only on my arms which are really itchy. Turns out its bed bug bites! I bought some used mattresses from the thrift store and two days later my 3 year old has bumps all over her. The day care starts complaining and I took her to the doctor. The doctor said it wasn't contagious but he didn't know for sure what it was. Then we started seeing little bugs in the bed and on the top corner of our ceilings. I called the health department and explained to them what I saw and they told me it was bed bugs. My landlord sent someone out to take care of it and two weeks later they are still biting the whole family. I have a 1, 3, 4 and 9 year old. I really don't know what to do anymore. I cry because I don't like to see my babies scratching and crying all night. If anyone has more suggestions, please post them. First, the bed bugs were found in my sister's room. I have never believed bugs existed in beds until I saw the bites and the real bugs on her bed. She discarded the whole bed. Now after three months, I begin to itch badly and saw red marks on my hands and legs. I then checked my bed and saw minute little bugs with a red dot, which was my blood. I looked behind the bed and got shocked as they have already infested and made a nest there. I thought the bed bugs bites were mosquito bites at first. I was covered in bites, and they were driving me crazy itching. The weird thing was that my boyfriend wasn't really getting bitten. Then we found a bug in the bed one night and figured it out. In the last week I have red bumps on my forehead and nose. They are not really painful, just looks bad. Were you able to effectively treat and rid your home of bedbugs? Please describe your experience with bedbugs in hotels. How have you prevented bedbug infestations from recurring in your home? 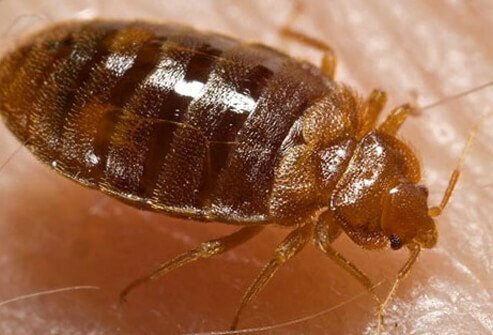 Have you seen actual bedbugs? If so, please describe them, along with your experience at home or at a hotel.